Audio Production for Auto Attendants, Voicemail, Message on Hold | 8x8, Inc.
Give your auto attendant, voicemail, music, or message-on-hold that big-business sound. 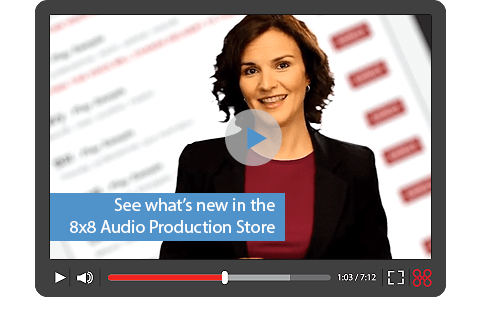 Enhance your 8x8 phone system with professionally recorded greetings, messages and music. Choose from a wide variety of voices and music to suit your company’s image. Voice Production for greetings, auto attendants, IVR prompts, voicemail, narration, etc. Give your business a professional and consistent voice. Write your own script, select the voice and we’ll quickly and easily create an effective audio brand for your company. Write your own script, and use our online self-service store to select the voice, choose the background music and we’ll record, mix and deliver the completed program. Choose hold music from our extensive music library. Now your voicemail can have a professional greeting. Go with personalized content, voice of your choice, and even add a stock or custom audio logo. Perfect for home offices and on-the-go salespeople. Just select a voice and submit a script to transform your outgoing message into the professional presentation that distinguishes you and your business. When your Custom Message-On-Hold order is received you will be assigned a script consultant who will create a rough draft of your script for your review. You’ll have the opportunity to edit and revise the script, and sample voice talent and music selections before the script is recorded.